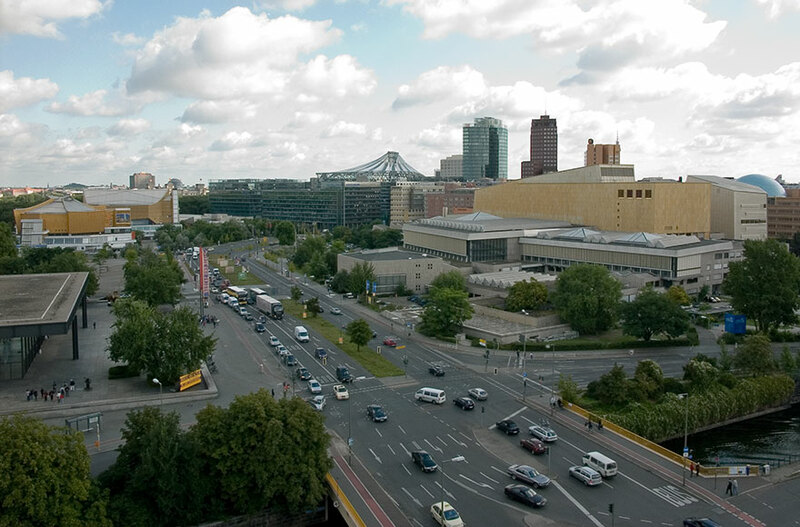 For the shooting of the film, Pots­damer Straße is blocked off for an entire day between Schöneberger Ufer and the crossing at Grunewald­straße so that a female jockey on a race­horse can ride along it at walking pace. This 2 km ride is accom­pa­nied all the way by a camera following the rider. The uncut video is shown as a perma­nent loop on a north­facing LED monitor mounted above the pave­ment of Pots­damer Straße. The line of vision of the viewer corre­sponds with the direc­tion the horse is moving in. The horse and female rider, seen from behind, pull the viewer into the picture as a repous­soir. 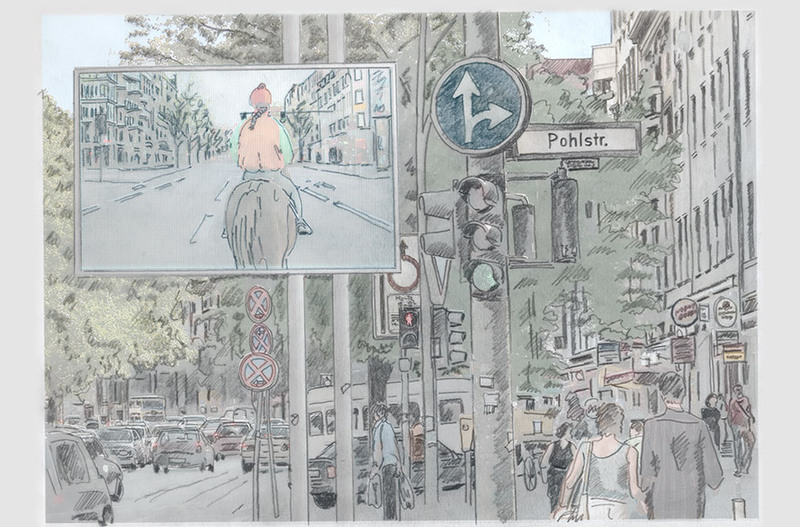 The video thema­tises the urban space in Pots­damer Straße in several ways: on the one hand it is a modern main road, on the other it was a route people went along with horse and carriage. The film confronts us with the history of Pots­damer Straße: the trading route of the Middle Ages, the first paved street in Prussia, a grand avenue during the Weimar Republic, the setting for Nazi propa­ganda, then ulti­mately sepa­rated by the Berlin Wall. Goldberg’s video lends a new meaning to the past of this place steeped in history. The varied history of the street and its former glamour, which still remains etched into the public conscious­ness and accounts for the myth­ical status of the street, distin­guish it from other busy and cultur­ally diverse shop­ping streets in Berlin. 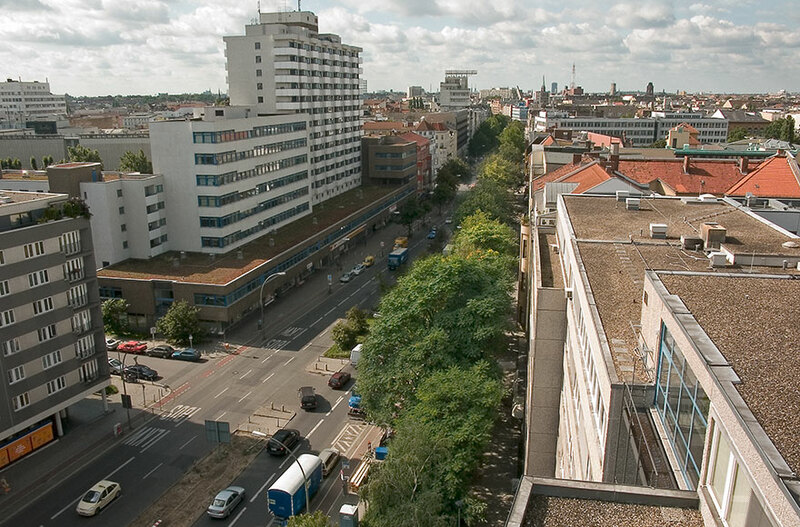 Deprived of traffic and people, Pots­damer Straße would seem unreal. By being blocked off, it becomes a stage “awaiting” an event leading to a reversal of its usual rest­less­ness. The elegant race­horse and its rider are consciously used as an antithesis to the battle horse of the tradi­tional eques­trian statue demon­strating power. Further­more, the horse, trained for speed and to win races, moves at an unusu­ally slow pace. This reversal, walking instead of galloping, leads to a slowing down and a new percep­tion of the street. 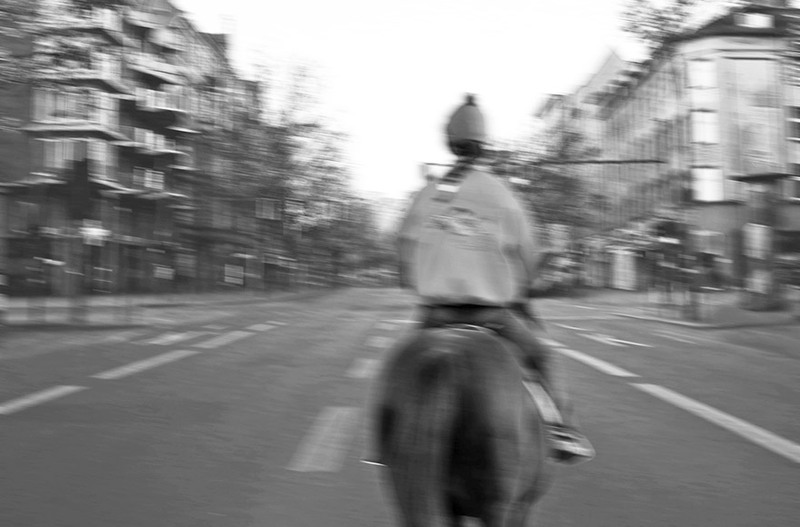 The pictures one would expect from life in the big, glitzy city are replaced by a surreal situ­a­tion in which the laws of time and space no longer seem to apply: a race­horse with its rider in the German capital, on Pots­damer Straße, no people, no cars and no other protag­o­nists. Organ­i­sa­tion, co-oper­a­tion and prepa­ra­tion for the project are part and parcel of this artistic project. The expe­ri­ence, which includes the street’s resi­dents, consists of exten­sive joint prepa­ra­tion work as well as seeing the street just once completely empty and tidy after the shoot. Since the street is blocked off for the whole day on the day of the shoot, resi­dents and visi­tors alike can savour this unique expe­ri­ence. The entire street comes to a stand­still, takes a deep breath, then carries on again at the usual pace.